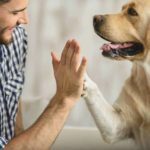 Most owners like their pets to be with them as much as possible. That includes when on a road trip. 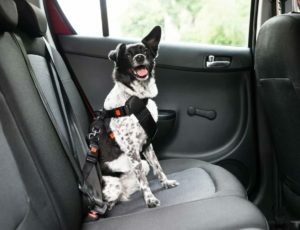 But it is not just a matter of bundling the dog onto the back seat and setting off. Nobody would do that with a child nowadays, so why think it’s OK with a pet? Driving with a loose animal in the car is dangerous for the pet, the driver, the passengers, and other road users. Animals can distract the driver. They can climb onto the front seat and get in the way, and they can get frightened and bite. If you don’t know what they are up to, mysterious noises from the back can make the driver turn around unnecessarily. Loose animals can make an accident much worse. 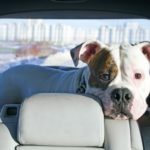 In a collision a dog can crash into the back of the driver or passenger with a force of several thousand pounds, causing serious injuries or death. If emergency services are called, an unrestrained dog can threaten fire and ambulance crews and prevent them from doing their job. If windows are open they can jump out. Prepare your pets for long journeys by having short ones. Let them learn that a ride does not last long before they get to play and have a treat. Have an appropriate vehicle. An animal should not ride on a truck bed—if you are doing some tough driving then a rugged 4×4 like a Jeep Cherokee would be much more suitable. Buy the right restraining equipment. You can get special seat belts or, to make the best use of space, have a crate which is built to the vehicle’s size. A crate should have a door on the front as well as the back, in case your tailgate is crushed. 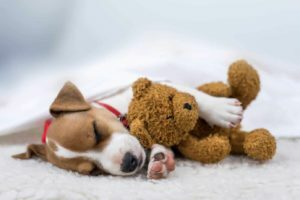 If you have two or more pets who have a tendency to scrap, use a divided crate or some other means to keep them reliably apart. Make sure your pet has a good and secure identity disk and a microchip. 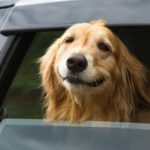 Do not open windows enough for pets to stick their heads out—lots of dogs love this but it damages their eyes and exposes them to the danger of being hit. 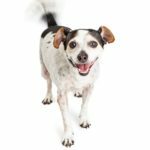 Do not restrain dogs with a collar leash. It could kill them in a collision, or strangle them if they get stuck. Be sure to stop frequently on the road (every couple of hours, at least) for exercise and toilet breaks, for their sake and for yours. Look out for motion sickness. If necessary get medication from your vet. Never leave an animal in a parked vehicle without reliable ventilation and guaranteed shade. Do not leave them at all in very cold conditions. 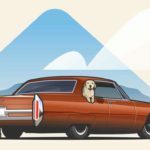 Your pets want to go with you everywhere, but you are responsible for their safety and their behavior whether at home or on the road. By taking a few sensible precautions, you can safely share your vacations and your road trips, and come back with the richest of memories. Joanne Richards enjoys seeing new places, and more often than not takes her dog, Joey, along for the adventure. 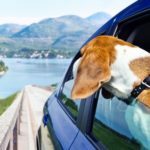 Jo writes about local travel destinations and how you can travel with your pet in her articles.